The U.K.-based magazine sees digital subscriptions rise 19 percent YoY in North America. The Economist is following the trend of Trump-era subscription success, with a growth of 19 percent in North American digital subscriptions since the election. This puts the London-based magazine in the ranks of Vanity Fair, The New York Times, and The Atlantic, which have all seen subscriptions surge since November. 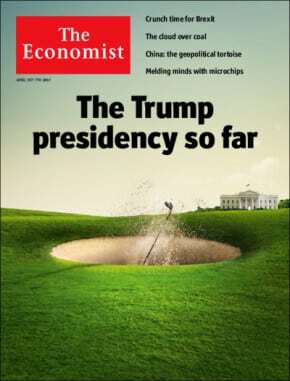 Unlike Vanity Fair and The New York Times, there hasn’t been any public tension between The Economist and the president of the United States, though the globalist magazine did endorse Clinton, and has run six semi-provocative Trump covers since the election. Nonetheless, The Economist attributes its successful subscription drive to the news-hungry environment that has developed since November 8, and adept marketing which seized the moment. “You can see that the news environment is increasing demand for quality content, and certainly [we have] had all of the right marketing initiatives in place to capitalize on this,” Marina Haydn, SVP of circulation and retail marketing for The Economist, tells Folio:. Haydn describes a marketing plan which highlighted the magazine’s Trump coverage in order to attract new audiences. While initially the team relied on content marketing, they have since shifted toward demand-driven audience initiatives. These include direct-response broadcast TV, digital out of home campaigns, digital marketing programs, and experiential marketing campaigns, such as the branded distribution of cricket-covered waffles. One Facebook banner ad, for example, featured multiple Trump covers with the tagline, "If the world is falling apart, at least there is something to read." Notably, the brand claims that the digital marketing campaigns increased conversion rates tenfold compared to normal campaign conversion rates. In addition to digital subscriptions, the coverage of Trump has permiated the print space. The magazine found that on average, covers that have featured Trump sold 14 percent more than other covers. Trump Bump or not, this increase is no mistake. The Economist has spent the last few months buckling down on its North American audience. As the magazine grows more awareness in the U.S. market, North American digital subscribers have come to represent 35 percent of annual subscription volume. This number, pulled from the period between December 2016 and February 2017, is a 30 percent increase YoY. See our earlier story on The Economist's expansion into the North American market.